BUTUAN CITY, March 28 – Responding to the call of President Rodrigo Duterte to implement the “Build, Build, Build” program and under the mandate of TESDA Director General, Secretary Isidro S. La Peña, the Technical Education and Skills Development Authority (TESDA) in Caraga launches the Onsite Skills Training and Assessment spearheaded by the TESDA Agusan del Norte Provincial Office in partnership with the Department of Public Works and Highways – Caraga and Local Contractors Association in Caraga. A total of 371 Candidates for Assessment will undergo training under the various qualifications under the Construction Sector. The training for those who will undergo assessment will be held in the industry sites so as not to disrupt their work schedule. The qualifications that TESDA-Caraga will focus on the following qualifications with the number of participants for each qualification identified: HEO (Backhoe Operator) – 48 participants, Rigid Highway Dump Truck–45, Bulldozer Operator – 14,Driving NC III (Articulated) – 33, Wheel loader /Pay loader – 5, Grader Operator – 6, Crane Operator – 20, Welder – 50, Carpenter – 80, Mason with 70 participants. 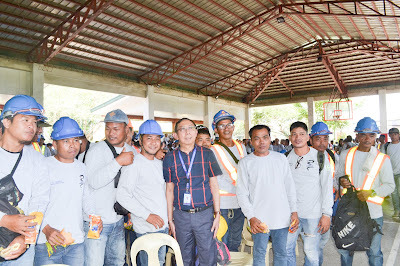 This is a five-day skills upgrading to be conducted by the trainers of TESDA Caraga in the different venues in Butuan City, and then Assessment for each qualification will follow. The participating contractors are Adfil Construction, NNAHARO Builders, CZARLES Construction, Fountain Head Construction among the many others that TESDA and DPWH will tap for this program. 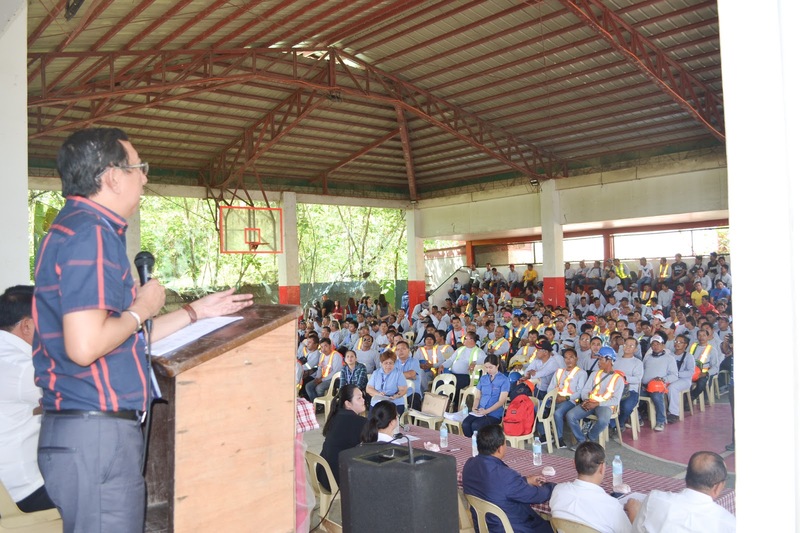 by various officials of TESDA and DPWH, TESDA Caraga Director Florencio F. Sunico, Jr. was overjoyed as this was the largest gathering of the construction sector in Caraga in time for the silver year of TESDA as an agency. Sunico was delighted that quite a number of TESDA programs will be put to good use in this convergence, making it more significant as this is being led by the private-sector. LUNGSOD NG BUTUAN, Marso 28 (PIA) - Sumuko ang 64 na mga miyembro ng Communist Party of the Philippines – New People’s Army (CPP-NPA) at mga tagasuporta nito mula sa Sitio Ibuan, Barangay Mampi, Lanuza, Surigao del Sur sa 36th Infantry Battalion, Philippine Army. Ito ay sa harap ng puspusang kampanya ng pamahalaan kontra terorismo at pagtulong sa surrenderers. Ayon kay Thelma Salazar, kagawad ng Barangay Mampi at isa sa mga surenderees, dati na siyang tagasuporta ng teroristang NPA sa kanilang lugar at nagsilbing kalihim ng makakaliwang grupo. Paliwanag ni Salazar na wala siyang intensyon na lumaban sa gobyerno at pumatay ng mga inosenteng tao. Dahil sa kalayuan ng kanilang barangay at kakulangan ng sapat at tamang impormasyon ay madali silang nakumbinse ng NPA na sumanib sa kanilang grupo. Laking pasasalamat din niya sa inisyatibo ng pamahalaan na silay masagip mula sa masasamang gawain ng NPA at mabigyan sila ng panibagong buhay. May panawagan din sya sa iba pa nilang kasamahan na nasa bundok kasama ang NPA kabilang na ang kanyang anak na si Ivy at asawa nitong si Paquito Delicona. “Nananawagan ako na sana magkasama na tayong pamilya. Sana umuwi na kayo at magbalik loob sa gobyerno. Sana makonsensya kayo dahil kung nag-seserbisyo kayo sa taong bayan, mas lalong kailangan kayo ng inyong mga anak,” sabi niya. Kasabay ng kanilang pagsuko ay nagkaisa rin sila kasama ng mga residente sa pagdeklara ng persona non-grata sa CPP-NPA-NDF sa kanilang lugar, sa tulong na rin ng barangay officials at tribal leaders sa pagbuo ng resolusyon ukol dito. Napag-alaman na sa nakalipas na taon, may mga engkwentro na rin ang naitala sa pagitan ng militar at teroristang grupong NPA sa lugar. Ang Barangay Mampi ay kauna-unahan din sa bayan ng Lanuza, Surigao del Sur na buo ang loob sa pagdeklara ng persona non-grata sa CPP-NPA-NDF. Ipinahayag naman ni Lieutenant Colonel Xerxes Trinidad, commanding officer ng 36IB, Philippine Army na suportado nila ang inisyatibong ito ng Barangay Mampi. BUTUAN CITY, March 28 - A total of 300 seedlings of Mangrove Tree were planted on March 22, 2019 in Brgy. 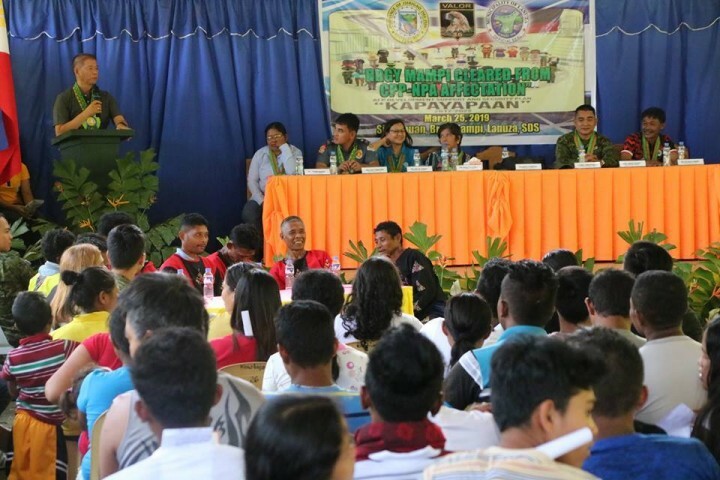 Lumbocan, this city, as the Department of the Interior and Local Government (DILG) Caraga joined in the celebration of World Water Day 2019. Some 150 individuals composed of DILG Caraga Regional Office and DILG Butuan City personnel, members of the RHub composed of Bayugan Water District and Propegemus Foundation, Inc. personnel, Department of Environment and Natural Resources - Nasipit personnel, Barangay Lumbocan officials, students of Lumbocan National High School, and residents of the area participated in the Mangrove Tree Planting activity. The participants gathered at 6:00 a.m. at the grounds of Lumbocan right before riding a Bangka or boat to get to the islet across the mainland where the seedlings would be planted. In his talk, Winston Salvador, Deputy Director for Operations of Propegemus Foundation, Inc., a member of the RHub enjoined the participants, especially the students, to relentlessly advocate for the conservation of water given the current overpopulation and climate change the world is in dilemma with.